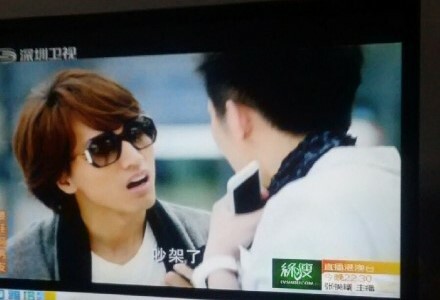 On the other side of the story, our main male lead Li Tang (played by Jerry Yan) appears and to say that I didn’t react with a squeal or a big grin on my face when he appeared would be the biggest lie ever. Let’s just be honest and say that majority of the people are actually watching this drama just because Jerry’s headlining it. So he got this scarf from the stranger and that already made him happy. 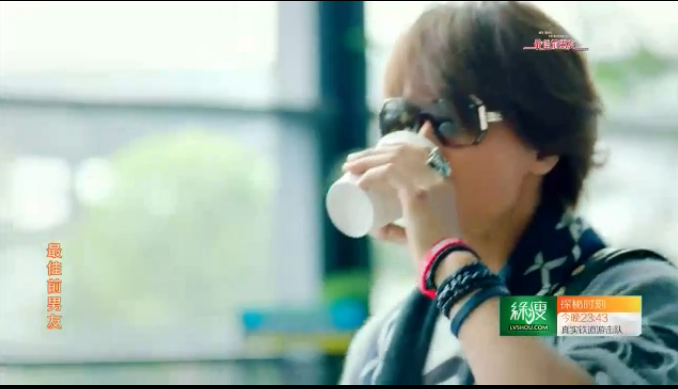 This scene seriously reminded me of Jerry’s Dao Ming Si days haha! I’m not quite sure if he just randomly stumbled upon the area of where the ongoing photoshoot was because he just looked picture-perfect handing out a balloon to a little girl. 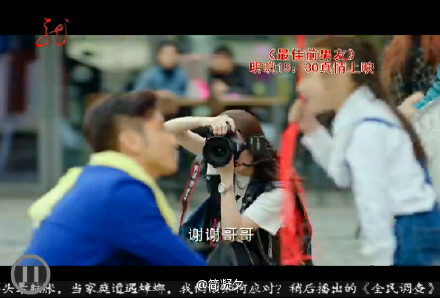 Fangsi kept taking photographs of the male stranger who happens to be Yin Hao Ran (played by Ron Ng) until he noticed what’s been going on. He called her out and left but Fangsi chased him wherever he went. Back to Li Tang, he shares a romantic dinner with his girlfriend but the view outside with the large glass window/door just distracts him as he barely listens to their conversation. He caught a glimpse of Fangsi (she did not see Tang) walking with Hao Ran and I’m not sure if his girlfriend was able to see what he just saw. 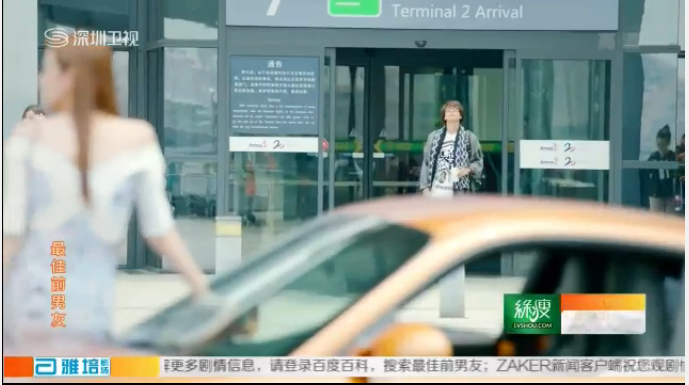 Not the specific screencap but Fangsi tries hard to get Hao Ran as a model but he refuses again and again. They were almost in the middle of the road so they were definitely causing traffic when the stuff inside Fangsi’s bag fell which caused her phone to fall into a canal (yikes!). Tang’s friend, Tang Huang (played by Jiang Bing), who provides comic relief in the drama, interrupted our current couple’s lovey-dovey moments. This is also the part where you can see that Xiang Nan saw Fangsi outside already that she was intentionally trying to catch Tang’s attention. This time, Fangsi saw the two of them being intimate so she stormed away. 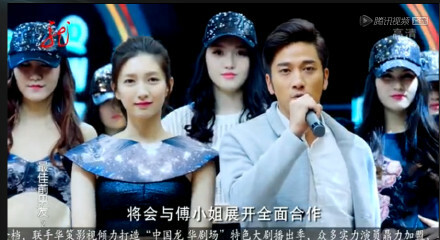 One of her assistants did not understand why but when her other assistant, Xiao Nai (played by Du Yuchen) saw what was happening, she knew right away the reason why Fangsi acted that way. My favorite part of the episode (which badly needs a screencap! ): Cheng Xiang Nan vs. Fu Fangsi! Since Xiang Nan already saw her outside the window, she waits for Fangsi outside and some form of verbal catfight just happened. Xiang Nan told Fangsi that she’s already dating Li Tang who happens to be the CEO of Don Juan garments where Xiang Nan is the endorser/model of the brand. Forgive my muddled brain but as far as I know, the first episode ends here! 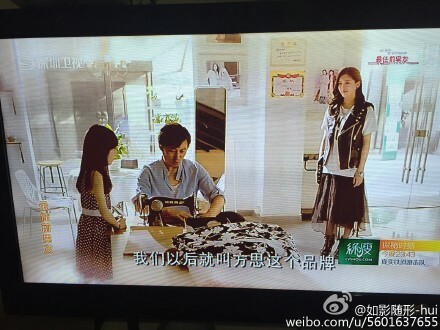 Fangsi goes back to her studio as she reminisces (enter flashback scene) her roots as a designer/seamstress. Her father was also in the clothing industry and he taught her ever since she was young which gave good memories to her until now. Back at the present time, she looks at an invitation to a fashion event/show in which the story of the next episode will revolve around. Fangsi rushes back to find out that her work has already been destroyed. She barges in the Don Juan room and accuses Xiang Nan right away. Of course she denied it because why would she do that, right? Unfortunately, her sabotage was caught by the surveillance camera so no way to escape the wrath of our main female lead! And so my favorite parts are here which all happened during the fashion event! Hao Ran’s apparently one of the judges/organizers in the fashion show. I wasn’t able to include this in the recap of episode 1, but a co-worker or someone superior to him was not so happy that he was helping Fangsi and it’s probably because of this event. While Xiang Nan walks for Don Juan, Fangsi and Xiao Nai think of a way to salvage her sabotaged work. Luckily, our heroine is smart and thought of a way in a snap! Fangsi walked the runway and looked perfect with her salvaged creation of course. This kind of storyline is all too familiar that it reminded me of Jenny Humphrey of Gossip Girl and Makino of Hana Yori Dango if you ask me! Li Tang finally appears into the episode! Yup, I really waited longer compared to the first episode where he appeared almost right away into the episode. 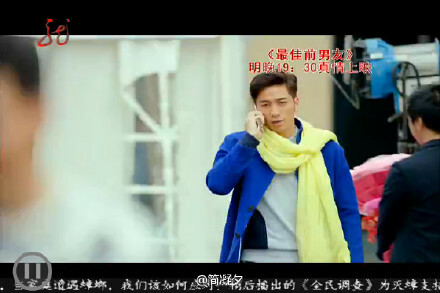 His wild imagination of Hao Ran being with Fangsi appeared as seen in the screencap above. He was definitely not satisfied seeing his ex-girlfriend with some other man enjoying the spotlight all to themselves. So it’s time for his light bulb to work! 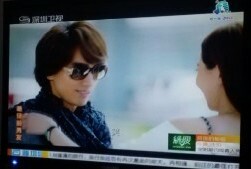 He calls Xiang Nan and she goes to him without knowing why. And our very first kissing scene in the drama happens! He declared his love for her and proposed with a matching precious necklace. As expected, they stole away the spotlight from Hao Ran and Fangsi. Nice way to make someone jealous, Tang! What would you feel if you saw your ex-boyfriend/former love declare his love for someone else? At least in the drama world, this calls for flashback scenes! Fangsi reminisced the old days when she was still with Tang and just because the words he uttered for Xiang Nan during the event seemed all too familiar for her. The first dialogue between the main leads finally happened. Tang was bragging about his earlier proposal to his former lover and they talked about other things which didn’t turn out so good of course. In a matter of a snap, Fangsi, who just finished reminiscing her good memories of Tang is now carrying a dark cloud above her head. What’s next for these former flames? 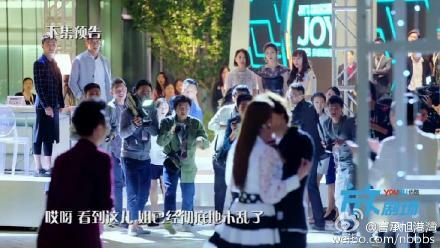 No screencap scene: The episode ends with Fangsi going home and here we were able to meet her jolly mommy. Again, I had no idea that the episode ended again so I really apologize for that! I even waited for a 3rd episode but apparently they’re just going to show 2 episodes in one night. My friend asked about my opinions on the drama and the first thing I said was, “I love the visuals and the fashion theme!”. The cinematography of the drama is really well done and everything was just a feast for my eyes. One scene that I really loved was during the fashion event when Li Tang appeared and looked at Fangsi on the runway. Too bad I couldn’t find a screencap of the scene but it was done nicely because from Tang’s perspective, it seemed that him and Fangsi were the only ones in the place despite all the people and the attention. I think I have watched enough C-dramas to say that the way “My Best Ex-Boyfriend” was filmed and edited is definitely of high quality. This should have been expected too given that three channels (2 TV, 1 web) are broadcasting it. Another major factor that shows that a large amount of money was spent on its quality is the fact that the actors were not dubbed. 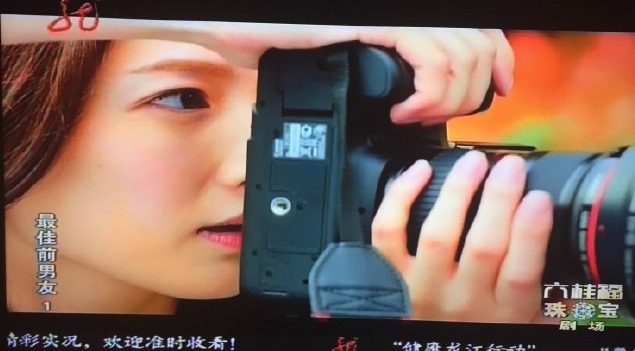 I’m not saying that a C-drama has a low quality when the actors are dubbed but one factor why the production team decides to dub is because getting a sound/microphone system that blocks out the outdoor noise can be pretty expensive. Most of the scenes in the drama were actually outside and the fact that they were not dubbed is already saying a lot about the production quality. I have listened to the drama’s opening song even before its premiere but I couldn’t say much about it yet. Although when I listened to it again twice since there were two episodes, I actually learned to love it! As a Jerry Yan fan, I was honestly expecting him to contribute to the OST because he actually did for 95% of his projects. So it’s really surprising that this drama is part of the 5% haha! As for the other songs, maybe give me more time to have a clearer opinion. I have only watched Maggie Jiang in “So Young” (2013 C-movie) which is also the reason why she became famous despite her supporting role there. 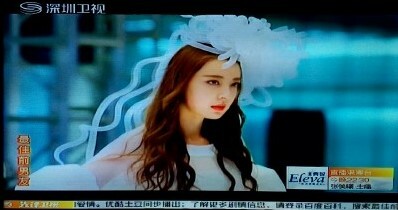 As early as the first episode of the drama, I believe that she portrayed the character of Fu Fangsi so well. A smart, confident, and fierce lady who is not willing to let anyone or anything stop her from achieving her dreams as a fashion designer. As for Ron Ng’s Yin Hao Ran, I think I’ll still need more episodes to watch since I have yet to understand his character’s motives, desires, etc. It’s also my first time to watch him and I actually can’t wait to see more of him in the following episodes. Viola Mi’s Cheng Xiang Nan can be your typical female drama villain that you’d love to hate her here! I just loved her character and acting in “My Sunshine” (2015 C-drama) which is why I’ve been looking forward to see her performance here. She was also a model there but I can already easily distinguish her character there from “My Best Ex-Boyfriend” with the latter being bitchier haha! Jerry Yan’s Li Tang is a combination of his Meteor Garden’s Dao Ming Si and My Splendid Life’s (his first C-drama back in 2011) Liu Yuhao. Cool, confident, and overbearing but actually has a soft side when it comes to matters of the heart. There were some scenes with him that I just couldn’t help but laugh and I’m not sure if it’s about the drama trying to be funny or maybe him in those ridiculous high-fashion outfits is enough to make me chuckle. Either way, seeing him on the screen just makes me happy since he became my ultimate Taiwanese love because of his amazing acting (I’m quite aware that he has a lot of haters in terms of his acting though). The story is so simple but we all know that it can never be simple in the Chinese dramaland. Tang and Xiang Nan may be enjoying their love right now but we all know that it’s too early to tell given that they’ll be seeing their former lovers a lot. I also love that they showed Fangsi’s childhood memories in relation to her profession now. As a fan of Western fashion-themed shows like Gossip Girl, Jane by Design, and Carrie Diaries, I just love how this drama does not disappoint in showcasing the fashion industry. See you in the next episodes! Never knew that writing these kinds of posts could be so stressful! It is only through your comments/feedbacks would I know if I should continue but I promise to make it so much better and with lots of perfect screencaps to fit my narration as well 😀 So what do you think of “My Best Ex-Boyfriend” so far? Do we share the same sentiments or not? Or are you interested to watch it now or not? Hope to know your comments here! I am currently watching this drama and looking to read recaps and reviews and glad I found this blog. I am addicted to this drama right now. Love the ending song so much. C-dramas are long and given that this one has over 40 eps, there’re gonna be tons of misunderstanding, love square, love-hate relationship and more. Please continue with the recap on My Best Ex-Boyfriend. Hi! Thank you so much for reading 🙂 I’m still on vacation so I’ll be working on it when I get home. Your comment already inspires me to keep blogging! I will look forward to your recap. 🙂 Btw, do you know if this drama is airing 2 eps a day, 7 days a week coz ep 1 and 2 started on Saturday. I like your views on this drama especially your First Impressions. I have given my comments on Ron Ng, guess you are not too familiar with him. Looking forward to your continuous recap of this drama that we fans can gather here to voice our thots and support. I am hoping that Hao Ran will not end up with Xiang Nan as I find her too superficial…..he deserves some like Fang Si…..ah but then there will be two guys competing or Fang Si. So glad that it is over 40 episodes as K dramas have around 50-100 yet they always bombed in the middle. So wishing that all fans of this drama will be entertained right to the end as T dramas most times dont get to be aired much to the global viewers. You are so nice! Your comments motivate me to keep writing about this drama. I also believe that this drama deserves to be watched by everyone else and I hope that it’ll be consistently good as well 😀 thank you so much for your comments! I love this drama. 12 episodes have been released and just love the songs played in this drama. We can already tell that Yi Tang has never forgotten Fang Si (Fancy–such a clever brand name of her old studio). I would help contribute with subbing but it looks like Viki subbers are quite fast. They subbed the two episodes released yesterday within 12 hours. WOW. I saw your blog when I was searching for the number of episodes this drama will have. I really like the two male leads Jerry and Ron the former from his brilliant acting in Loving Never Forgetting, where he delivered lines and retorts at his hapless PA in a dead pan expression that if you dont follow the dialogue one will miss the joke. Needless to say, Ron was doing well in TVB dramas, I like him in all of them. But I think he did well in Cubicle Woman however it can take him a while to express his funny side in Mandarin. Im totally shipping Maggie Jiang as Fangsi….she sealed this drama when she gives as good as she gets to the villain of the piece, XiangNan…..many a times she rebuffed her words and left her speechless……..that is what makes this drama stands out….a confident, talented and hard hitting heroine. Last but not least but the comic relief provided by Li Tang’s assistant , who kept yelling at LT to foot the bill before he rushed off, and LT always trying to kiss him is really LMAO material. This drama really deserves a wider viewing rather than the spin off the mill K dramas nowadays. 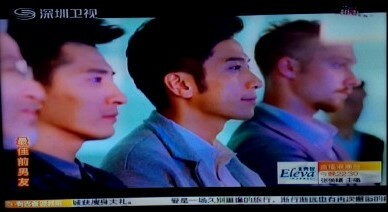 I’m a pretty new fan in the C-ent circle that’s why I only got to know Ron Ng from this drama. Thank you for providing more info about him 😀 Maggie as the heroine is one of the best things in this drama too! Thank you so much for reading 🙂 I’m currently writing the recaps for the next ones already! Hi Dramarian, thanks for your reply. I really like T, C and HK dramas over K dramas……I dont think Im thew odd one out ….as after a while all K dramas blend into the same scenery. If you are new to Ron Ng watch him in Triumph in The Skies….one of his best. Im eagerly waiting for each ep of MBEBF, like another fellow commentor here has been asking does it air daily or only Suns and Mons (Ive read it somewhere, maybe Im mistaken)….cant wait for the next eps. 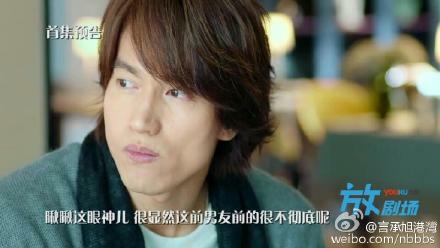 I just love every movies Jerry Yan had made. Good choices of stories, it stick to everyone’s mind.. Simple but penetrating to your bones..I just love him I consider him as my long lost son…How I wish….Whatever they say about him I’m still his number one fan equal to his mother…It is his acting that makes your mind wiggle doodle. The emotions, compassion I just love the way he act. His acting ability to express his love to his screen partner was always touching to everyone’s mind including mine. I can’t blame the world to love and cherish his performance. Kudos to Jerry !!! When you come to America please stop by Chicago pls…My family will welcome …. 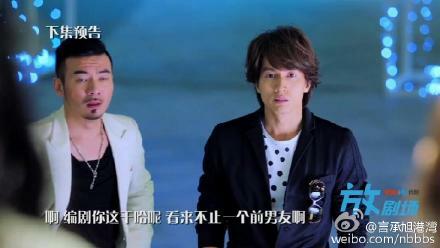 Hoping he regain again his outstanding popularity after Dao Ming Si .. I know people tend to look for new broad of good performer, but Jerry Yan is one of good ones that will touch your heart out…I’m not a younger woman who will go a gaga to any celebrity now nor watch soap opera. On my younger years I was with the Beatles, I admit😔.. But after watching Unforgettable Love everything changes in my early retirement life.. His movie with Ella Down With Love made me realized of my younger years how naive I was. His movies let you go back in time and I salute to his script writer as well. It’s only now I realized that’s why they are giving recognition for this category (Oscar Award) because they are the backbone of the stories. Without good stories actors are nothing😉😍. So, Jerry have confident on yourself you are changing someone’s life. To some you are giving hope for their lifetime. To some you are their inspiration. To me you are my long lost son. Don’t you know I accepted my ancestor lineage because of you, ain’t that something?